All the tasks listed in the leadership skills section at TrainChurchLeaders.com have the potential of making us more effective leaders. I’m not sure I can identify the top, most needed, skill but team building ranks high on the list. God clearly indicates His intent for us to function as a team when He refers to the Church as a Body (1 Cor. 12). 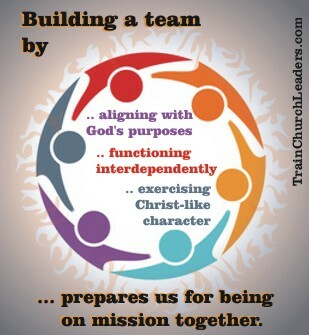 Certainly team building should be a primary role for leaders in the Church as a whole and among staff. 1) Teams need to align with God’s purposes. Unity is much more likely when it’s based on a high enough purpose, not just a task or project. 2) Building a team requires learning to function interdependently. Bringing personal agendas to the table hampers teamwork. We need to be in this together which means we sometimes lay aside our own opinions for the good of the whole. 3) Teams must exercise Christ-like character toward one another. His humility and servanthood in us will enable us to serve effectively together even when we disagree with one another. When we build teams that align with God’s purposes, function interdependently, and display God’s heart through Christ-like character toward one another, then we’re ready to go on mission together.